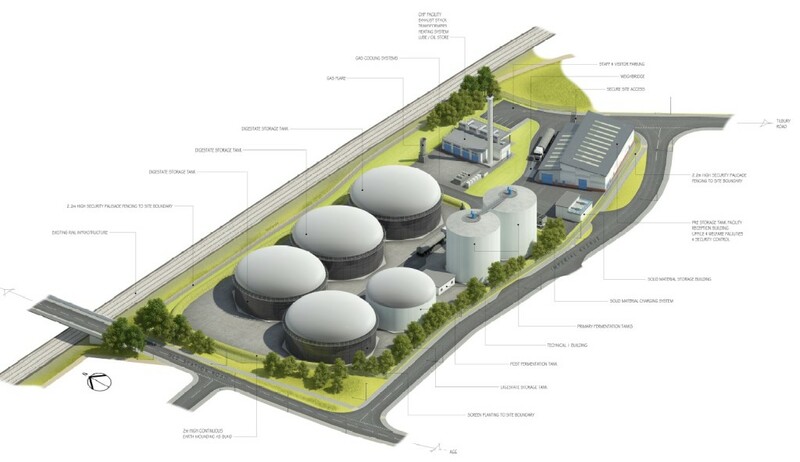 NEW 5MW BIOGAS PROJECT | Shaw Renewables Ltd.
Our German partners, BioConstruct GmbH, have succeeded in signing an EPC contract with AVG Imperial Ltd. for a waste-to-energy anaerobic digestion (AD) plant in England. The construction works on the biogas plant began in December 2015 so that the combined heat and power generators (CHPs) can be commissioned and ready in September 2016. “This contract underlines our strategy to focus on waste to energy projects along-side our agricultural biogas plants,” said Managing Partner Henrik Borgmeyer. The plant will be able to treat various types of organic waste and is designed to give the operator high flexibility regarding the type of feedstock he wants to digest. This will allow the Owner to optimise its income and react to changing market conditions. The generated electricity will be fed into the National Grid and the generated heat will be used to heat the digesters to 40° Celsius and to pasteurize the digestate so that is can be used on the land. In the long-run the heat will also be used by neighboring businesses and operations. The plant will be operated by BioConstruct’s UK-based sister company BioConstruct NewEnergy Ltd, which is also providing maintenance services for different AD plants in the UK. With more than 300 projects in operation and 15 years of experience, BioConstruct is a leading provider of turnkey biogas plant solutions in Europe. With this latest contract, the company from Melle in Lower Saxony has made another successful step in establishing itself in the European market. The 5MW biogas project will deliver electricity to the grid – providing enough low-carbon energy to power over 10,000 households using approximately 109,500 tonnes of feedstock per annum sourced from local businesses. The operation of this plant will generate 8 jobs and support around 30 jobs.